“No, Tareq, no, back up,” he said quickly, as the little hulker’s hand flailed out in empty space. There was a clattering metallic sound from within the cabinet as he squirmed, and another small pot tumbled out and onto the steel counter below. Tareq turned his head and grabbed the round handle of the cabinet door beside him, and Mhumhi saw an arc of smeared blood on his cheek, a deep wound cutting through his lip. His tail stopped wagging. So, too, did his fortunes turn for the worse again, because the other painted dog was getting up from the ground, where it had lain nearly forgotten. Apparently the heavy pot had dealt it quite a blow, because it was staggering and dizzy-eyed, but it was cognizant enough to look up and stare at Tareq. That was it, that was the end of the game, thought Mhumhi, his heart pounding. The dog’s eyes had lit up with recognition. From somewhere else in the room he could hear Kutta’s yelps and Vimbo’s yowling, as they dealt with the rest of the pack. At the moment, only he and this single dog knew where Tareq was hiding. The painted dog looked back at him, as he bared his teeth, and trained his ears forward. Tareq backed up but did not close the cabinet again. The painted dog gave a lunge upwards, his forepaws scraping on the steel counter as his jaws snapped below Tareq’s face. Mhumhi hurled himself at him and got his teeth into his back, and they fell back together and rolled on the dirty floor, all limbs and teeth. Mhumhi felt a hot sort of energy propelling him that had been absent before, and his teeth caught and slid through the flesh of the dog’s left ear, making him howl. They jumped apart. The other, bleeding and panting and not so confident anymore, flicked his eyes to the side. Before he could run Mhumhi leapt on top of him, biting into his cheek and chin and eye. There was a scream. 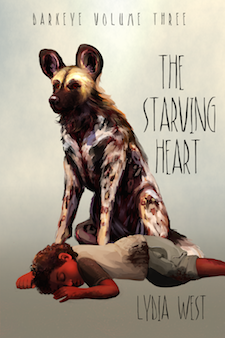 Mhumhi opened his jaws and bit into the dog’s throat, pressing down, his heart hammering in time with the pulse in the dog’s neck that he could feel with his tongue. The painted dog whined, pushing against his shoulder with one paw while his others slipped and tried to brace against the floor. Mhumhi could feel his windpipe closing under his teeth. He let go, and the other fell down onto his side, wheezing, fat tongue hanging out. Tareq scrubbed at his eyes with one fist, whimpering when it disturbed his wound. “Where’s red dog?” he asked again. Mhumhi looked over to where he could still hear sounds of the ensuing fight, hidden behind another long metal counter. The painted dogs were chattering, like they had been on the hunt in Big Park. He could see the tips of their waving tails. Tareq looked at him a moment, then pulled the cabinet door shut again. Mhumhi picked up the still-gasping dog by the scruff and dragged him roughly backwards several feet. He did not think the dog would be getting up again anytime soon, but it did not hurt to disorient him further. He still felt hot and strong, his teeth wet and whetted with the fact that he had chosen not to end the painted dog’s life. It felt powerful. He leapt up onto the next counter and without stopping to thing flung himself down into the mass of chattering dogs that were surrounding Kutta and Vimbo. That was Kutta, and he felt the dog on his back jerk and squeal and fall away. He turned around, panting, and saw her snapping and snarling to drive the dog away. Vimbo ran up, his short tail raised, lowering his head to give a long whoop. There was blood on his face and lips. “Are you all right?” Kutta asked him, in the sudden lull in the fighting. She looked weary, marked around her face and neck by bites. Mhumhi did not answer, and looked back over at the mass of the painted dogs, who seemed to be regrouping. There were still eight of them, though a couple were limping badly. Their eyes held more savagery than he had seen before. One dog stepped forward, and Mhumhi was startled to recognize Ligwami. Mhumhi eyed them, weighing it. They had certainly been more trouble than Ligwami had expected, that much was certain. And even with eight against three, it would still be a harsh fight to kill all of them… He broke off his train of thought, suddenly wondering where Mini had got to. The little dog hadn’t gotten herself killed in the confusion, had she? “You’ve no call to bargain,” Ligwami growled. “You may tell that to our hyena,” said Kutta. This seemed to take Ligwami aback, and he looked past her at Vimbo, who had his head high and his jaws opened, his black eyes trained forward. Mhumhi and Kutta braced themselves and growled, and the other painted dogs surged forward. Then they suddenly flinched and jumped apart. On the counter beside them had come a whoosh and a sudden lick of flame. The little ring of fire was coming from a sort of grate attached to the counter, and beside it stood Mini, looking none the worse for wear, if somewhat dirty with sawdust. Beside her there was a piece of sawdust-covered tubing that looked like it had been dragged out of the wall. “Good, I’ve got everyone’s attention,” she said, and reached out with a dainty paw and rolled back a little black knob in front of the fire. It dimmed down and went away. Mini turned and attacked the rubber hose beside her, growling, shaking it from side to side. Mhumhi watched, dumbfounded, feeling the similar confusion coming from all around him. After a moment of ferocity Mini released the hose. A hissing sound came from the toothmarks she had left in it, and Mhumhi detected a sort of rotten, sulphuric scent. “Do you all smell that?” she asked. There was a sort of shifting and staring. Ligwami looked caught between bewilderment and outrage. “Do you want to die?” he demanded. There was more silence. Mhumhi put his ears back and looked at Kutta, who seemed truly alarmed. Vimbo was tilting his head behind them, quite out of the loop. “Be quiet,” growled Ligwami, who seemed to have already grasped this- his forelegs were quivering a little. His packmates were still murmuring. “I said, be silent!” cried Ligwami, snapping his jaws. “She is bluffing. And if she is not, she and her friends will die too. Isn’t that right?” He turned his glare back onto Mini. Ligwami’s jaw went slack. Kutta gave a little bound forward. “Hush, wild dog,” said Mini, and she placed her paw back on the little knob. Everybody got quiet, and she raised her lips in a little grin. Mini tilted her head from side to side. Ligwami gave a soft growl, but it was clear she had defeated him. He jerked his head to the dogs behind himself, and they began to back out of the narrow space and turn around, trotting single file towards the exit door at the far corner of the room. As they filed out, he looked back at Mhumhi. “Go on, get out of here,” Mhumhi replied, showing his teeth, though he felt a little uncertain. Ligwami’s words sounded threatening, but his eyes were merely serious. He followed his brethren out then, a long line of panting wild dogs with their heads low and their tails tucked in defeat. The door swung shut after them. Nobody said anything for a little while after that, though Vimbo was looking around and grunting, evidently waiting for someone to fill him in. The little dog had lain down with her forepaws crooked over the edge of the countertop, and she grinned at him with her tongue hanging out. “Out of curiosity, are you planning on setting us on fire?” asked Kutta, her brushy tail twitching. “You have? Let’s see him, then!” exclaimed Kutta, giving a little bound, and Mhumhi had no choice them but to lead her back around to the other counter. Mini followed them, trotting on top of the stove still, and speaking rapidly to Vimbo in the hulker tongue as he loped along behind. “Tareq!” barked Mhumhi, as they rounded the corner, and then stopped short. The little hulker was down on the floor, sitting with his legs splayed next to the body of a painted dog. It was the one he had fought before, Mhumhi realized, and it seemed to be dead now. Tareq looked back at them, and there were more tears on his cheeks. “Oh, Tareq, your face!” cried Kutta, and ran to him, ears back and whining. Tareq flinched as she bathed his face, one paw over his shoulders. Mhumhi gave his tail a wag, but he was distracted, looking around. Mhumhi tucked his tail, feeling a jolt of guilt. He had killed the painted dog after all. “That’s right,” Mhumhi put in, feebly. Tareq did not reply- he looked behind Mhumhi and gave a little cry, clutching harder at Kutta’s neck. Vimbo had just emerged around the corner, Mini trotting above him. Vimbo looked at the now-sobbing Tareq, then at Mhumhi. Mhumhi himself felt relieved that he had not got a worse reaction than the hyena. “Tell him we’ll kill him if he hurts the puppies,” he told Mini. “I think he’s got the message,” she replied. Vimbo indeed was staying just where he was, watching Kutta trying to comfort Tareq. Tareq moved like he was going to scrub his eyes again but stopped when his fingers brushed the wound on his cheek. “Where is she, Tareq?” Mhumhi urged, stepping closer, quivering. The little hulker turned his head up to look at him, his eyes and nose glistening. “In the oven,” he said. Tareq raised an arm and pointed in the opposite direction than they had come. At once Mhumhi took off at a sprint, Mini following him with a startled yap. He skidded to a stop and let her catch up and she slid past him. “There, there, up ahead,” she gasped, and Mhumhi looked and saw a spatter of red blood on the gray-white tiles on the floor. He trotted over to them, feeling dread now. It smelled like Maha’s. The little trail stopped in front of a sort of metal and glass door embedded into the counter. The glass seemed to be corroded, but when he squinted through it he could see a dark lump within. “Maha,” he called, rearing up to scratch at the glass. The lump did not move. “How does it open, how does it open?” he demanded, spinning in a circle from anxiety. Mini gave another yap and sprang up onto the counter again. “Pull it down from here,” she said, putting her paws on a handle sticking out near the top, then scrambled out of the way when Mhumhi leapt up and put his whole body weight on it through his forepaws. The door swung down and open with a loud creak. He could see her and smell her clearly now- the lump was her back- and there was blood dripping down from the iron rack she was laying on to pool in the bottom of the oven. He thought he saw her stir, her elbow sliding forward. He got himself up onto the door and thrust his head inside to tenderly lick the side of her neck. She took a shuddering breath and turned her face slightly. The sight of her made Mhumhi want to howl. She was peppered in bite marks, her cheeks and her neck and her arms. One bite on her forearm was bleeding badly. He could do nothing but whine and lick at her, trying to wipe away all her wounds. She flinched under his ministrations, her eyelids fluttering. Mhumhi said nothing, only squeezed his eyes shut. He heard the tick-tick-tick of Kutta’s footsteps approaching a moment later. She tried to jump on the oven door as well, making it creak, giving little whimper-barks. Mini yapped at them, pacing on the counter. Mhumhi pulled his head back out of the oven to look up at her. He hadn’t noticed the hyena leave, but he wasn’t there anymore. Only Tareq stood behind Kutta, his thumb in his mouth and his brow furrowed. Mhumhi backed up, somewhat grudgingly, leaving only his forepaws on the oven door. Maha rolled over and looked at them all with hazy eyes. “Your arm,” whimpered Kutta, and she went forward and gently put her mouth around Maha’s forearm, over the wound. Maha gave a little twitch and shut her eyes again. The corner of her mouth was leaking a gentle drip of blood by the time Vimbo returned, trailing a large white sheet in his jaws. They helped Maha crawl out of the oven and down onto it, whining and tugging and encouraging her. She seemed to have little to say, just curled up again in exhaustion as soon as she touched the fabric. “Tear off a strip of fabric,” Mini told Mhumhi. She was likely right there, so Mhumhi did as she said, ripping a large piece of the fabric away and letting Tareq hesitantly take it from his jaws. There was still mistrust in his eyes when he looked at Mhumhi. Mhumhi barely registered it. Time seemed to pass in a muggy blur as he stared at Maha, at her slow breathing. Under Mini’s patient instruction Tareq tied the cloth around her wound in a messy knot, and then Mhumhi, Kutta, and Vimbo each grabbed a mouthful of the sheet and dragged Maha together out of the kitchen and into the next room. The door the painted dogs had exited out of led to a very large room with many chairs and tables. The plush carpet on the floor made it harder to drag Maha, so they left her on her sheet just outside the swinging kitchen doors. Kutta and Mini warily investigated the room while Mhumhi lay down beside Maha and the still-recalcitrant Tareq. “Maha,” he whispered, nosing her, but she seemed to have fallen asleep. He gave a heavy, trembling sigh. “Where’s red dog?” Tareq asked, and he looked over at him, where he was sitting on the other side of Maha. Tareq flicked his eyes down, as if the apology was a physical thing, and he was examining it critically. It was a more complete statement than he’d ever heard Tareq say, and it couldn’t have been a worse one. Mhumhi found himself trembling harder. He looked at Maha, willing her to hear it too, to hear how ashamed and sorry he really was, but she had not moved. “They were gonna eat us,” said Tareq. Tareq met his eyes again, his chin wobbling, and belatedly Mhumhi backtracked. Kutta was trotting back to them, her tail high and waving. Behind her Vimbo was tugging and dragging something large between the tables. Mhumhi looked at the thing more closely. It seemed to be a narrow box on two wheels, with a covering over top, and strappy cloth things dangling out between two poles. Kutta looked confused, but Mhumhi recalled the abominable things they had put on him in the bouda’s lair, and looked at the cart with fresh distaste. Mhumhi was beginning to hate how right she always was. They let Tareq try to clumsily strap them in, with Mini’s possibly helpful suggestions, his little hands itching around in their fur as he dragged the straps this way and that. Mhumhi swallowed as they began to constrict around his chest. Tareq went around and did Kutta as well, but they really had to work to convince him to touch Vimbo, who was positioned in the center between the two poles. Mhumhi noticed that at some point Mini disappeared, but she reemerged almost right away from behind the swinging kitchen door, shaking herself. “Is it all set up?” she asked. “More or less,” said Kutta, shifting her feet. She seemed rather less comfortable with the idea now that she was actually strapped to the lot of them, especially with how she was jostling shoulders with coarse-furred Vimbo. Mhumhi was not thrilled about it himself. “Help me get the girl up,” Mini called to Tareq, and stood still when he toddled over and patted her clumsily. There was a tinge of urgency in her voice that had not been there before. Mhumhi turned around as much as he could manage to watch Tareq tugging on Maha’s arm and calling her. He thought he caught another whiff of that sulphur smell. Somehow Maha managed to get herself into the cart, then Tareq after, and then finally Mini jumped in herself into his lap. Mhumhi felt a bit irritated at this addition, and saw the same look on Kutta’s face on the other side of Vimbo, but he supposed it would be easier than trying to slow down for her short legs. Anyway, the weight of the three of them was comforting rather than annoying; it made the cart feel more solid and less unwieldy. Mhumhi felt a further stab of irritation at her cheerful tone- she had no right to be cheerful with Maha weak and fainting beside her- but he threw his weight forward. On the other side of Vimbo Kutta did the same. The hyena gave a startled giggle and braced his feet on the carpet. “No, no, Vimbo,” said Mini, and added something else in the hulker tongue. Vimbo turned his ears back, and them suddenly lunged forward, knocking the two of them right off their feet. He and Kutta pulled again, while Vimbo stood still, but only for a moment- then the hyena joined them, and the cart began to move, rocking slightly as they navigated between the tables. Tareq gave a little squeal that did not sound entirely unhappy. “Do you know where we’re going?” Mhumhi asked, voice a bit strained. He was trying not to go too fast for Kutta, who was the smallest out of the three of them; conversely, Vimbo kept having to check his much longer strides. “You didn’t say that before!” cried Kutta, trying to stop in her tracks. The combined efforts of Mhumhi and Vimbo forced her to keep moving forward. “Ah,” said Mini. She seemed to have nothing else more to say. They were all quiet for a bit, though it was more from trying to find a good pace for the three cart-pullers than anything else. They had to settle for a lope that made poor Kutta have to skip every three paces, but at least it pulled the cart forward fairly evenly. The straps pulled hard back against Mhumhi’s chest, but he found the experience surprisingly invigorating- the sensation of power it gave him- just so long as he managed to forget the fact that he could not get out of them freely if he needed to. They exited the hotel and the hot morning air hit them in a haze all at once. Vimbo stopped to cough, jerking the rest of them to a halt. “Why?” asked Mhumhi, looking all around, fearing that they’d run straight into the painted dogs again. But Mini had repeated herself in hulker, and Vimbo jumped forward like he’d been stung, and they all had to be moving again, racing down the street at what felt like a dangerous speed. Kutta was panting and bounding to keep up. Mhumhi jerked his head over and nipped Vimbo’s shoulder. The hyena whined, and then there came a massive whoosh-boom sound from behind them, and then a wave of heat. Mhumhi jerked the cart to turn it around, making it totter dangerously on one wheel for a moment before it thudded back down. Kutta was gaping beside him, Vimbo cringing. The lower portion of the hotel was very clearly on fire. It was lucky they had run a few hundred feet away before it had happened- for now it was burning merrily. Mhumhi twisted his head back to try and look at Mini. “nothing else more to say.” else or more, not both. She’s tiny and mad indeed! Hurrah, Mini!